161AT004 - APEXi Exhaust - N1 Evolution - Performance Auto Parts - Car and Truck Accessories | JM Auto Racing - Intensify Your Ride! 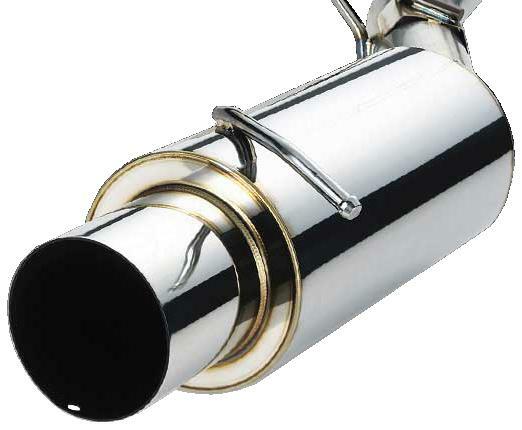 The N1 Evolution combines all the racing heritage and proven performance of the original N1 muffler but raises the ante by adding light weight, fully polished stainless steel piping. This is the ultimate N1 exhaust system. Mandrel bent, full stainless steel construction provides maximum power gains and resistance to rust or other damage caused by weathering. Like the original N1, the N1 Evolution uses the minimum amount of pipe bends to allow for greater exhaust flow. The N1 Evolution was created for those who are looking for something one step further than the classic N1 design. Available only for a select amount of vehicles, the N1 Evolution stands as a brilliant testament to exhaust system fabrication. Please note that, due to the tapered tip of the N1 Evolution exhaust system the ATS Silencer WILL NOT fit properly. This is only true for the N1 EVOLUTION mufflers, all other exhaust systems will fit without problems.